iPhone 5 finally lifted its veil on September 12th, 2012. From then on, live blogs and news about the September 12th event spread all cross the world. Apple addicts who keep their eyes on the newest handset surely know that this fashionable iPhone 5 comes with a longer 4-inch display, a lag-free multi-touch screen with a resolution of 640 x 1136 pixels that first supports a 16:9 widescreen aspect ratio, delivering exquisite, dynamic and sharp picture and vivid color. In other words, video enjoyment on this new iPhone 5 is ultimately excellent as it can be taken as a portable cinema, allowing you to have great visual feast on the go. 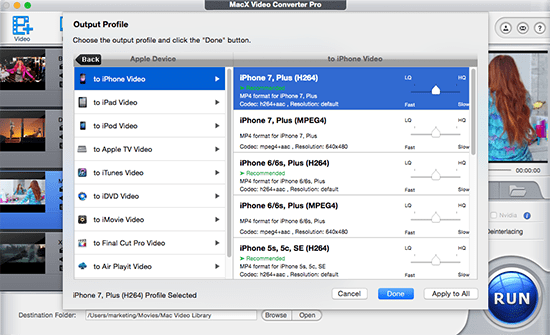 MacX Video Converter Pro constantly upgrades and offers optimized output profiles for iPhone Xs/X/8/7/6s/6/Plus, iPad Pro/mini 4/Air 2, Samsung Galaxy S9 (edge), etc. This program is specifically designed to encode video to iPhone Xs/X/8/7/6s/6/Plus, etc from SD videos and HD videos like MOV, AVI, MP4, FLV, M2TS, AVCHD, MKV to iPhone on your Mac or PC computer with utmost output quality. More importantly, the whole video to iPhone 5 process will be finished with the fastest speed due to the pioneering use of Intel's QSV/Nvidia/AMD hardware acceleration tech. Hence, you can play videos on iPhone 5 of your choice anytime. Fastest video transcoder on macOS Mojave/Windows 10 to convert any video in UHD/HD/SD to iPhone Xs/X/8/7/6s/6, up to 5X faster!! Step 1: Load Video by Clicking "Add File". 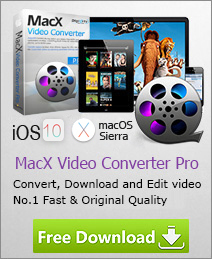 After free download this iPhone video converter on your Mac computer, or the Windows version for PC users, click "Add File" button to load the video. Select the output video you desire. Since you want convert video to iPhone 5, here you can choose "to iPhone" as your output format. Besides, a series of practical settings are provided to make personalized videos and you can change the default parameter settings to fit diverse multimedia devices and improve your video quality. After finish the above steps, click the "RUN" button to start decoding video to iPhone on macOS/Windows, you could view the conversion progress and are able to cancel the process at anytime. Note: Besides putting video to iPhone 5, this app also succeeds in converting video to iPad, iPod, Apple TV, Sony, HTC, etc. You can also download and convert video from YouTube to your iPhone as well as 1000 more online sites, so as to share those wonderful online videos offline with your friends anywhere.